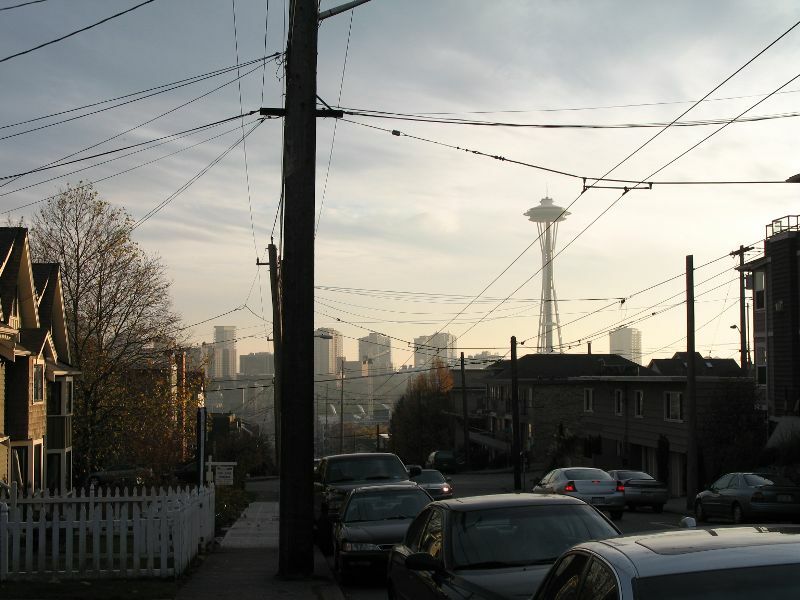 I recently moved to an apartment in Seattle’s Lower Queen Anne neighborhood. This is the view from the end of my block. Being just north of Seattle Center, the traffic can get horrible, but I don’t have a car anyway and there’s a grocery store five minutes away, so I can’t complain. 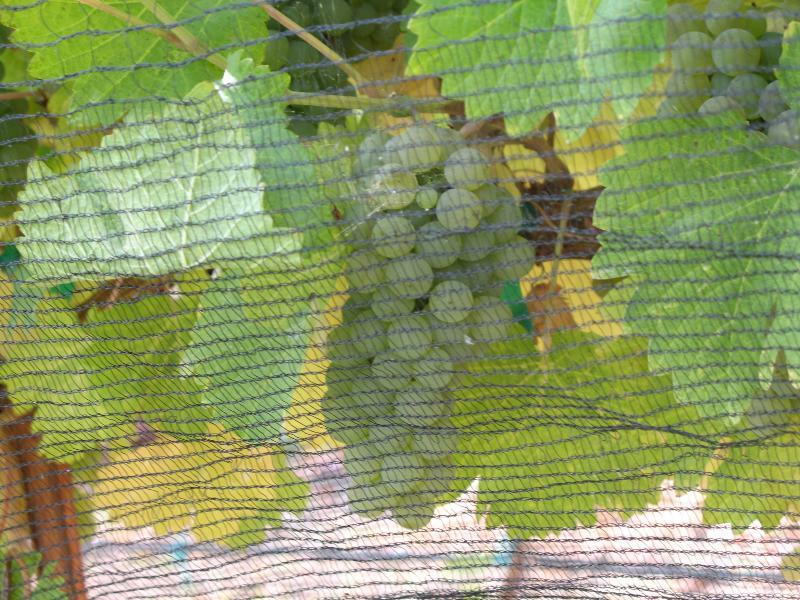 I made the move to my new home now and not sooner after returning from Japan because, among other things, I was helping with harvest and crush at my family’s small vineyard in the Yakima Valley. We picked crate after crate of grapes, and then crushed them, using both a small, hand-cranked stemmer-crusher and this big, powered version. 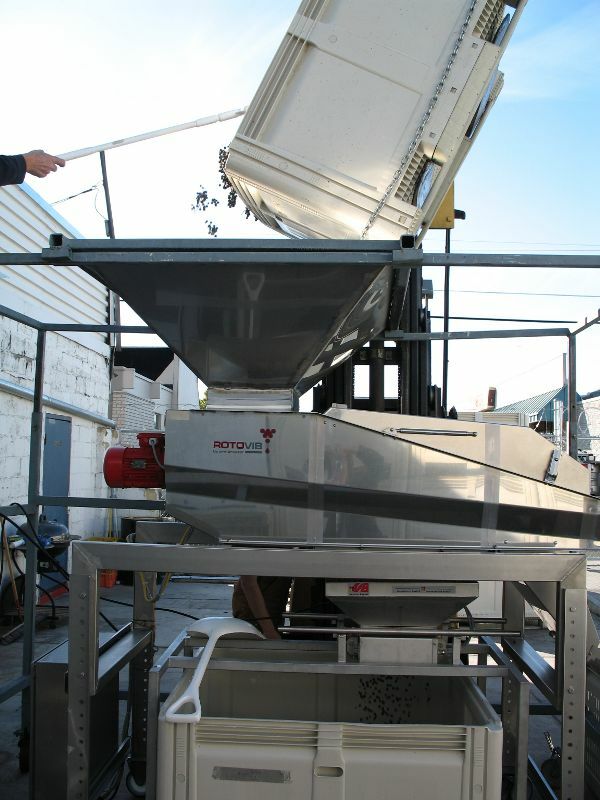 Stemmer-crushers are ingenious machines. 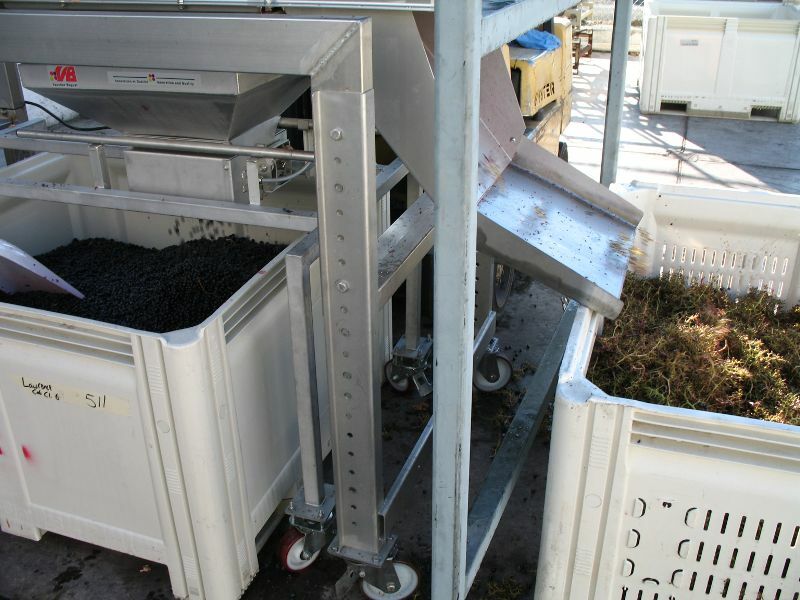 Crushed grapes come out the bottom while the “jacks” – the stems, leaves, and so on – are spat out the side. I also helped a bit with post-crush jobs inside the winery. Most of this actually belongs to another winery, by the way, from which my family’s winery rents workspace and equipment in an arrangement known in legalese as an alternating proprietorship. 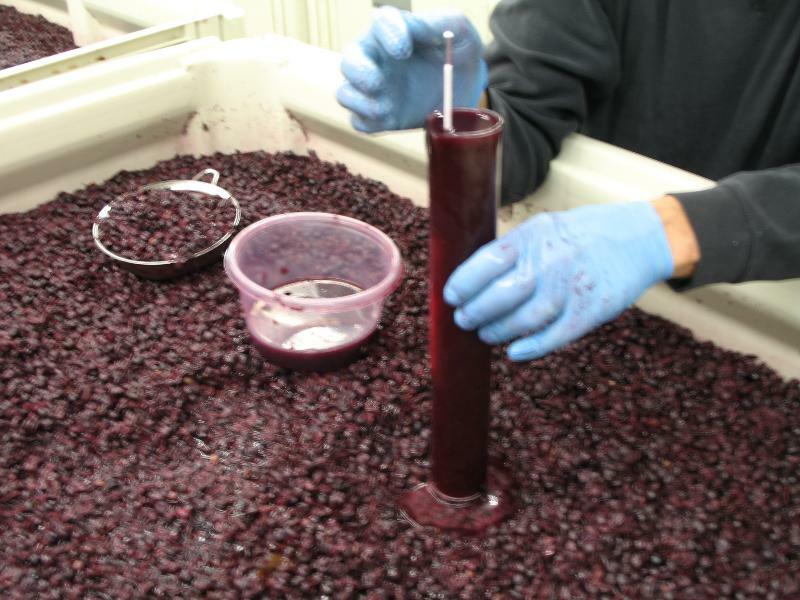 The plastic macrobins hold red wine while it ferments on the skins to extract color. (White wines, on the other hand, are pressed immediately, to ferment with juice and no skins.) 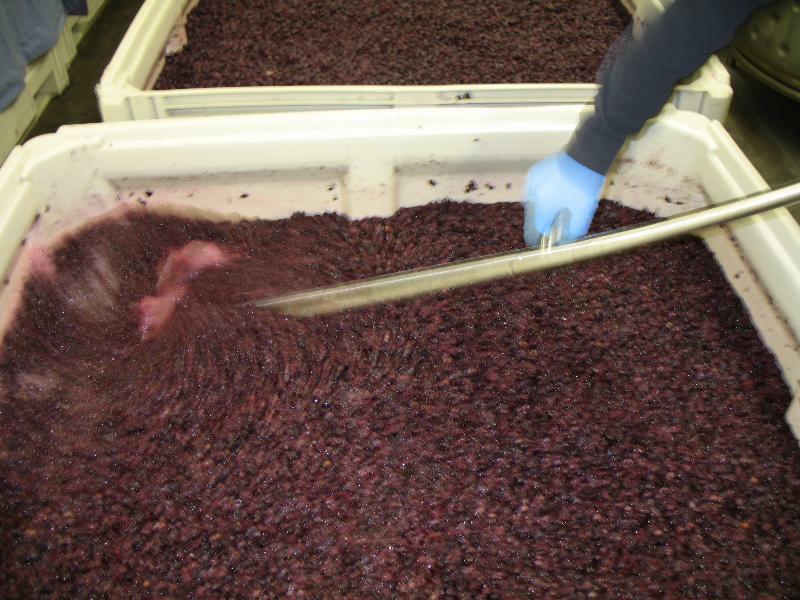 The crushed grapes have to be “punched down” three times a day. 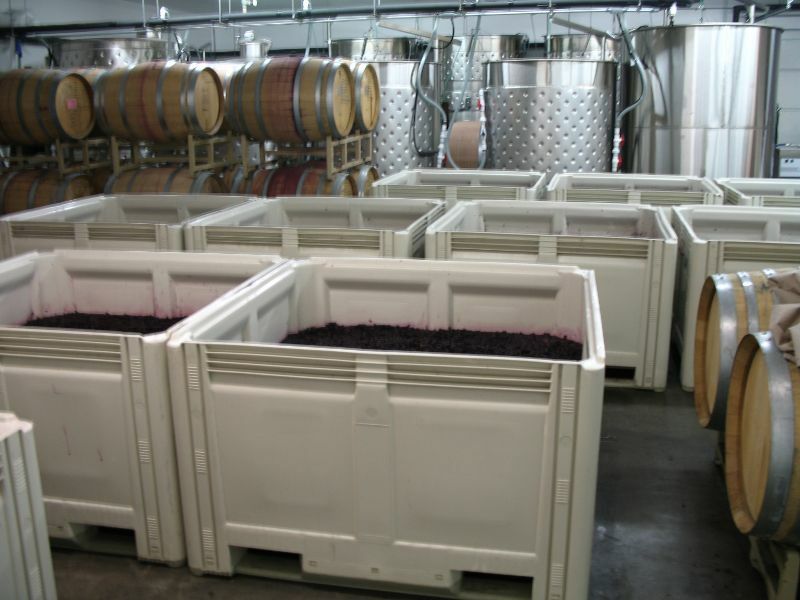 In addition to punch-down for red wines, with both red and white wines you have to constantly track temperature and sugar content as the wines ferment. Sugar content is gauged by measuring the specific gravity, the density, of the wine. This can be done with a refractometer, or, as here, with a hydrometer. To use a hydrometer, you read how high it floats and then adjust that number based on the temperature shown on its built-in thermometer. And I’ll end on that somewhat prosodic note. More posts on China to come. 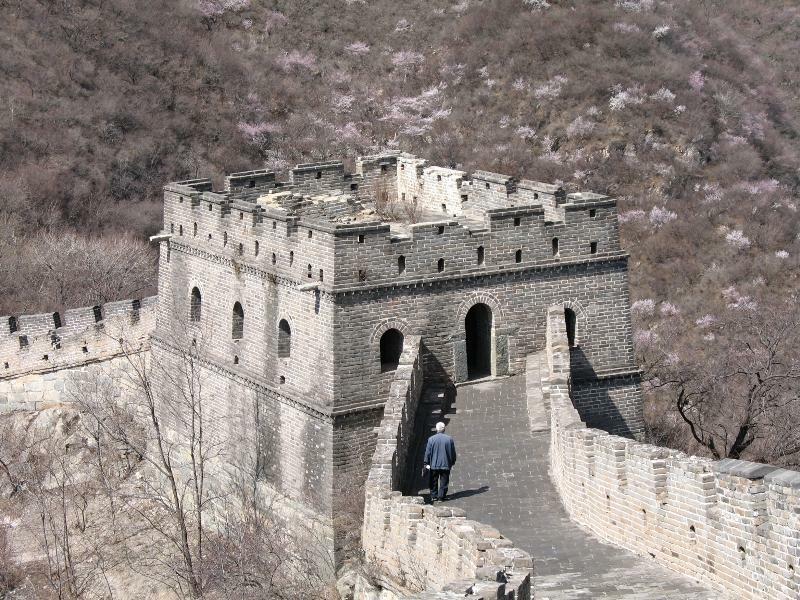 No trip to northern China would be complete without seeing the Great Wall, and there are several accessible sections near Beijing. 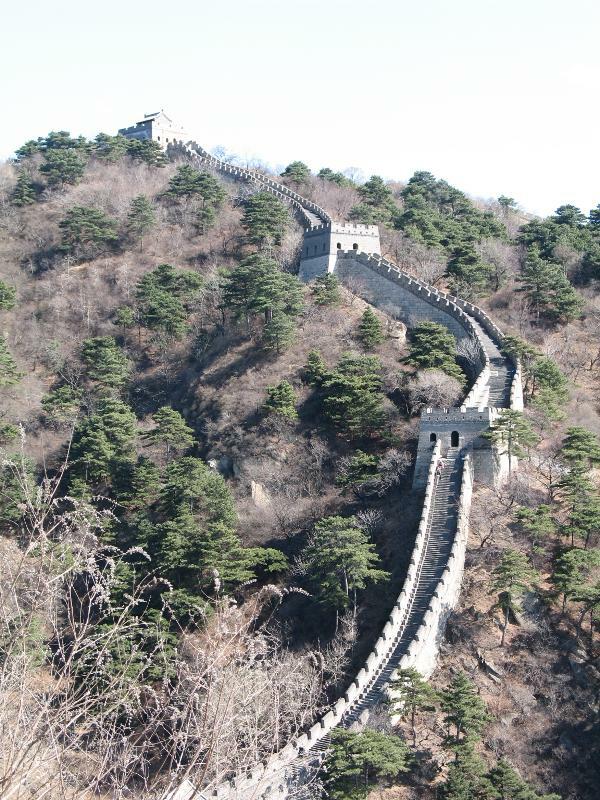 The most visited of these is Badaling. 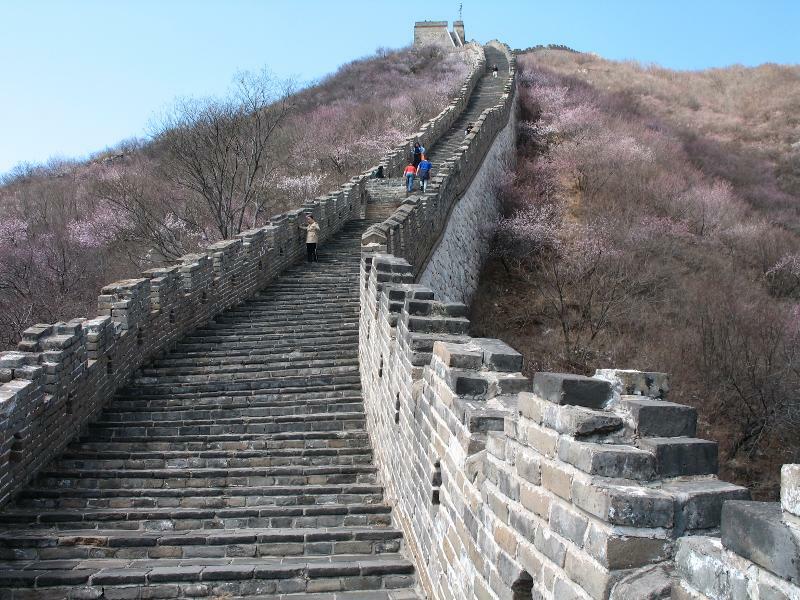 It is by all accounts the easiest part of the Wall to reach from Beijing, but also the most crowded and the most touristy. Fortunately, there are other options. 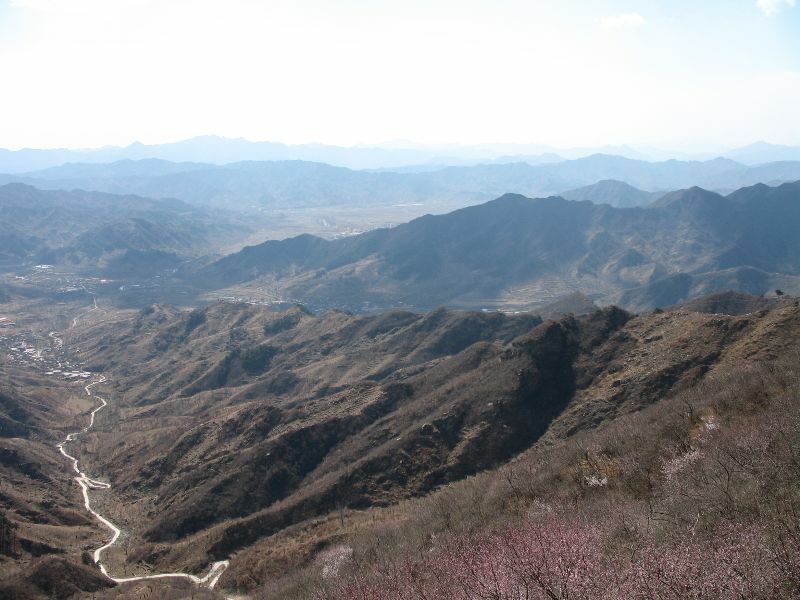 Wanting a less crowded experience that isn’t too much farther away, I went with Mutianyu. 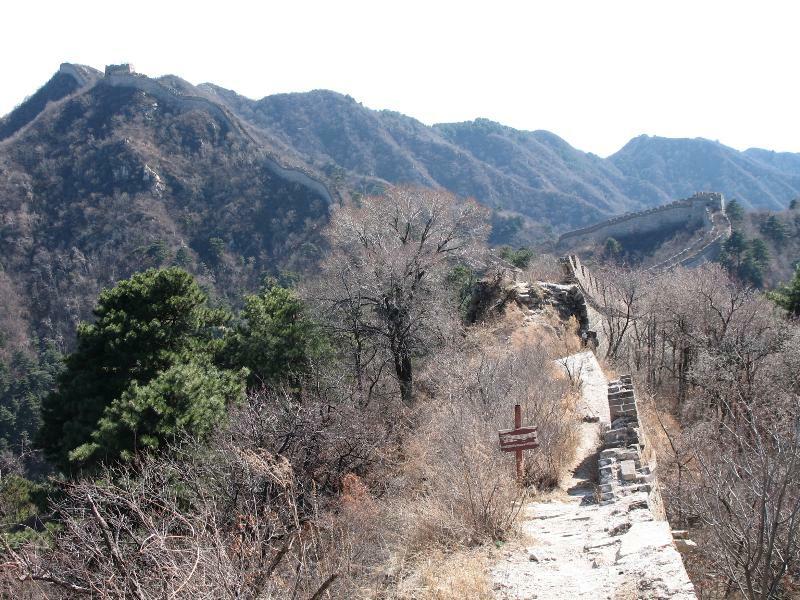 The Mutianyu (慕田峪) section of the Great Wall is 1.4 miles long and is about 40 miles north of Beijing. 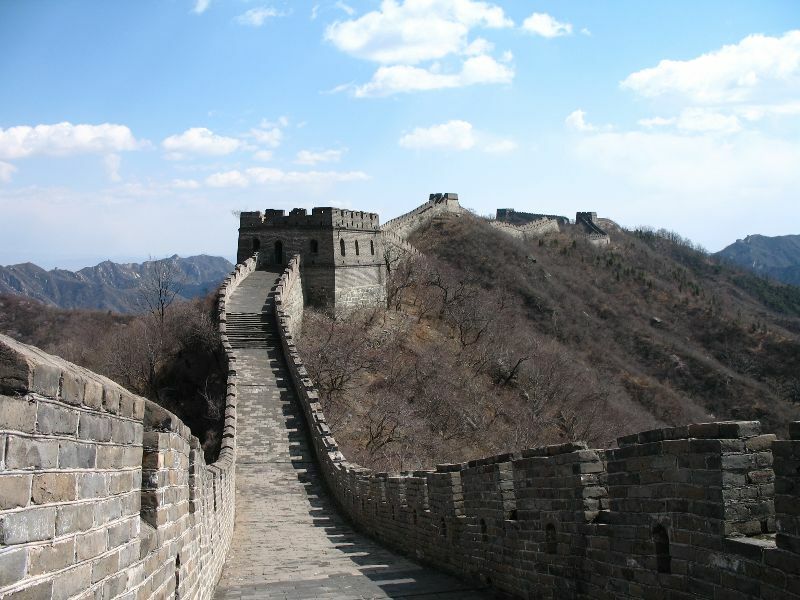 It belongs to a part of the Wall built by the Ming dynasty in the late 14th century on the foundations of a 6th century Northern Qi dynasty wall. It was restored around 1568 and again in the 1980s. Jagged mountains lie to the north. They continue for about 100 miles before giving way to the vast Mongolian steppe. 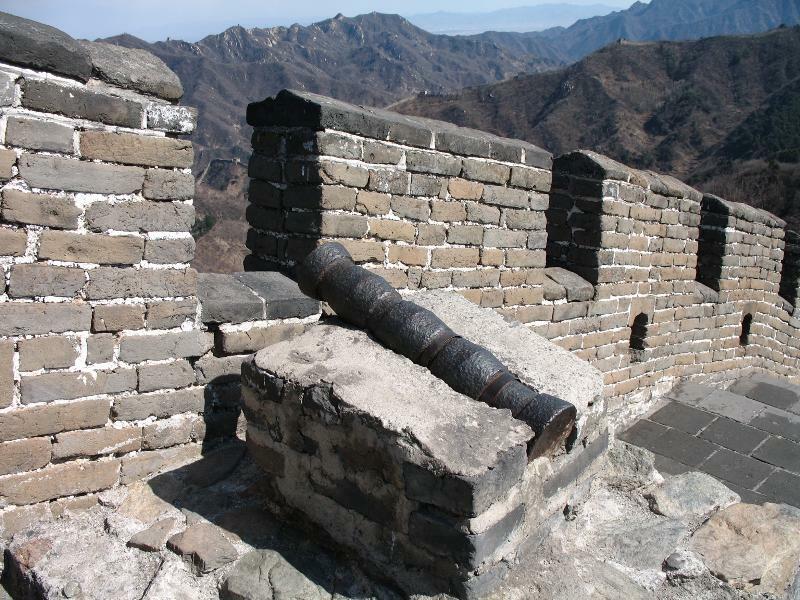 A few cannons still face the wilderness. 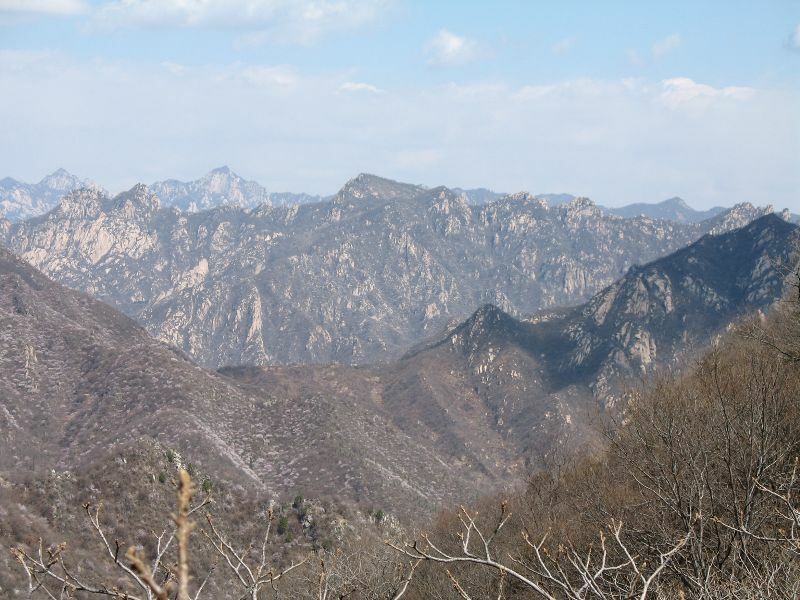 To the south, foothills stretch into the distance, flattening into the North China Plain just beyond the farthest visible ridge. 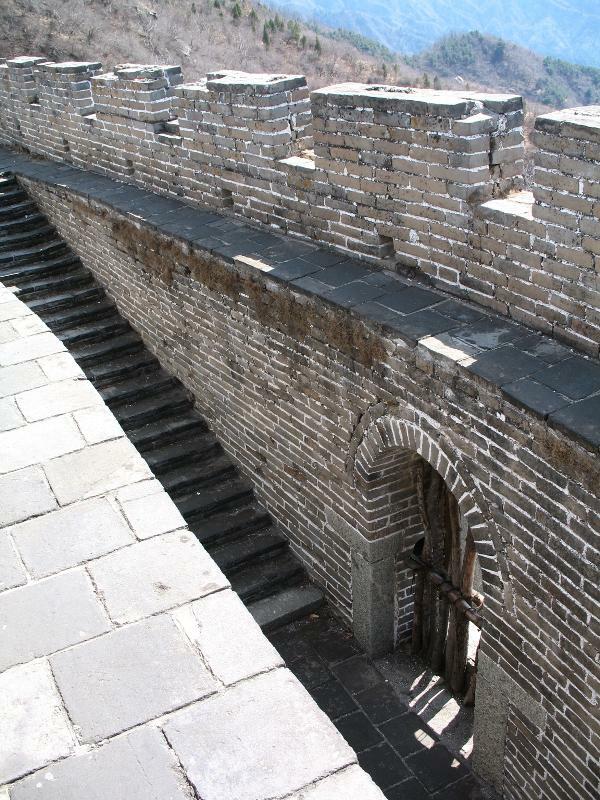 Unlike the north side, the south side of the Wall has an occasional door. 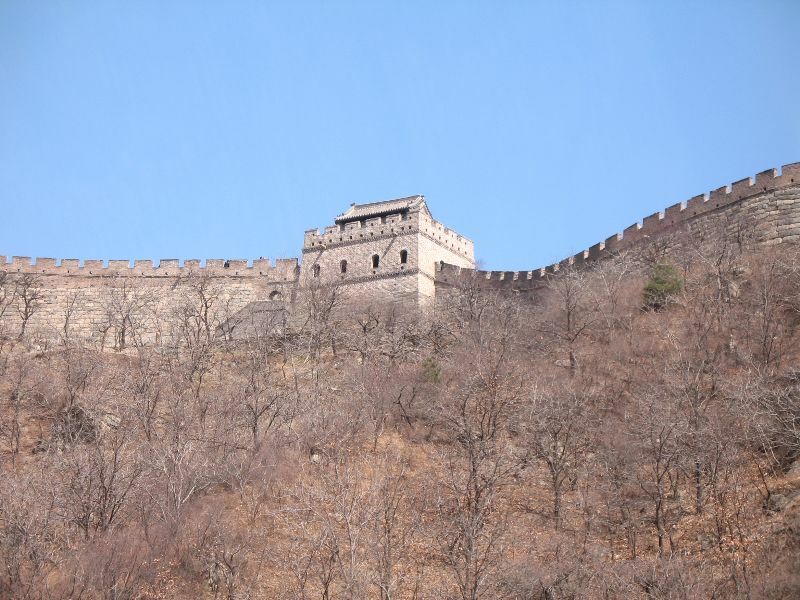 At the western end of the Mutianyu section, the Wall climbs steeply. 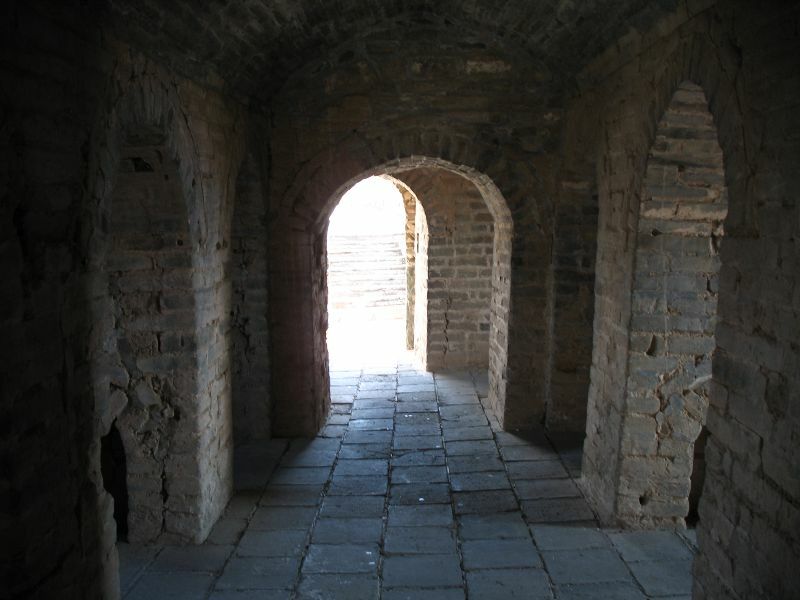 It continues in ruins, but visitors aren’t allowed to go any farther. The eastern end is a little less steep, but only a little. Here too, the Wall goes on in varying degrees of decay. 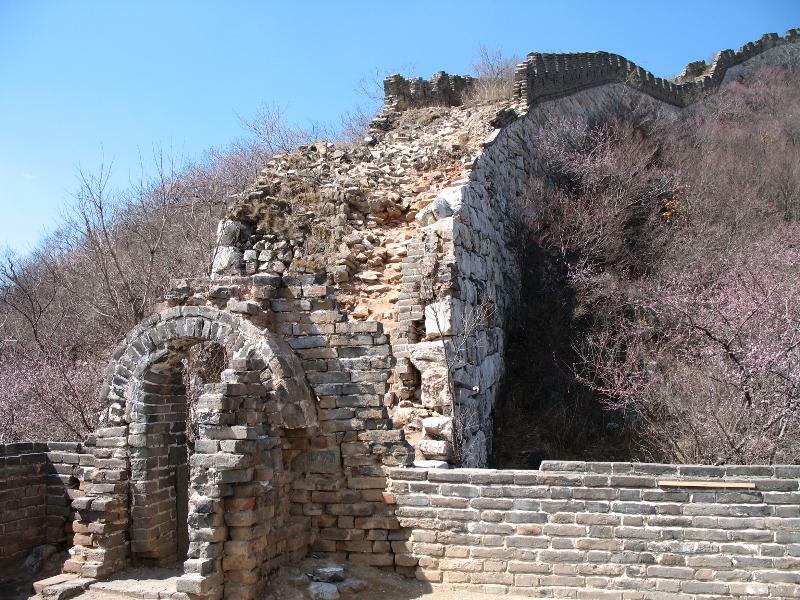 Between the two ruined ends at Mutianyu, there are 22 watchtowers. They vary in size and design, but they were mostly pretty similar inside. They’re bare and dark, but they’ve got some great views. I had an unnecessarily difficult time getting to Mutianyu, due to bad advice on when to transfer from bus to taxi. When I was in Beijing, getting to Mutianyu meant that you either had to join a tour group – which is usually overpriced and may involve side trips to “gem exhibitions” and the like – or you could take a direct bus on Sundays, or you had to do what I did (since it was Tuesday), which was take a bus to the town of Huairou and then find a taxi, haggle with the driver, and hire him for a round trip between Huairou and Mutianyu. Apparently, things have recently become vastly easier. There is now a direct bus between Beijing and Mutianyu that leaves hourly, every day. From outside of Dongzhimen Long-Distance Bus Station (东直门长途汽车站), which is near the Dongzhimen subway stop, take bus 936支. 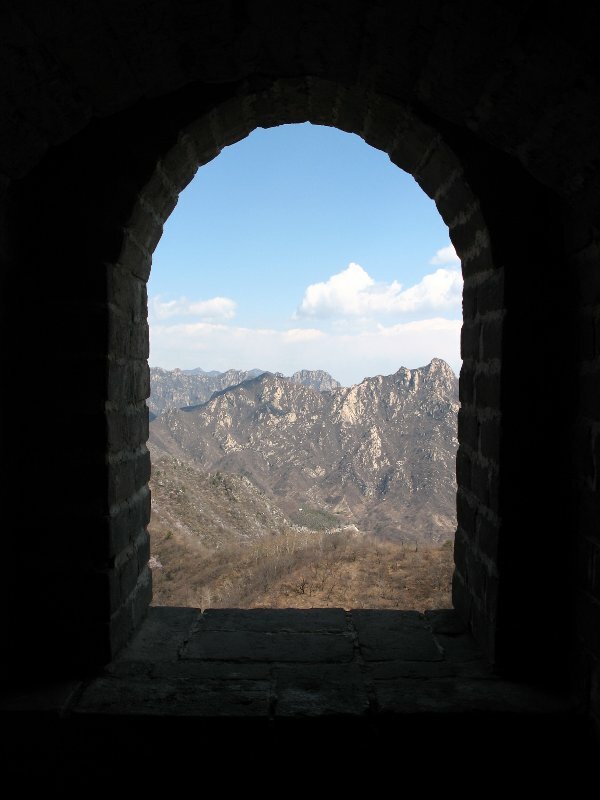 Check for a sign in the window saying Mutianyu in Chinese (慕田峪), as there is another 936支 that has a different destination. Ride the bus to its last stop, below the Wall. The price is 17 yuan each way. I really wish it had been that cheap and straightforward when I was traveling, but the new route only began this October. I suppose haggling with an unliscenced taxi driver is more memorable than just riding a bus, but for anyone making the trip, I’d recommend the new safer, cheaper, and simpler option. You are currently browsing the Erratic Dispatches blog archives for November, 2008.